As a heritage lover I’ve been on walking tours in cities all around the world. Everywhere I go I like to get the city’s history by walking around and seeing the sights. But I’d never been on a cemetery tour, and surprisingly never on a tour in my hometown of Hamilton. A recent tour given by historian Robin McKee of the Hamilton Municipal Cemetery was one of the best walking tours I’ve ever been on and revealed many layers of the War of 1812 in Hamilton. Robin McKee has been giving tours in the Hamilton cemetery for 11 years. They take place almost every other Saturday morning, starting in the spring run throughout the summer until November. For his efforts he will be receiving a Queen’s Jubilee medal. 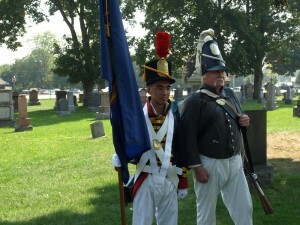 The tour started with an introduction of two re-enactors playing the role of the United States, and continued in a loop through the cemetery, where the large group stopped to hear stories of those buried there and how they were involved in the War of 1812. 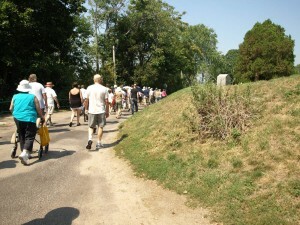 Like a traditional walking tour, the gravestones were used as a jumping off point for stories about the people there. 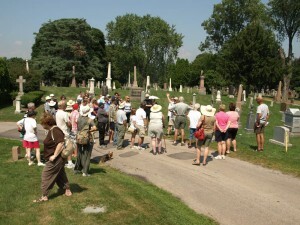 However, unlike traditional walking tours that are bound by Geography, the cemetery tour told a wider story across a wide expanse of time and focus on the specific War of 1812 theme. The first stop was the founder of Hamilton, George Hamilton, who served as a Captain during the war. James Gage and his wife Mary are also found in the cemetery; it was on their farmstead in Stoney Creek (now Battlefield House Museum), that the Battle of Stoney Creek took place. This stop on the tour exemplified one of the drawbacks of a cemetery tour; it is hard to visualize where the event took place as the only tangible item telling the story is a gravestone. Robin overcame this obstacle by providing a laminated historic photo of the buildings or people he talking about. 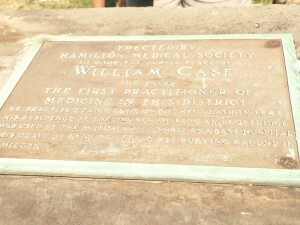 Hamilton’s first Doctor (William Case) is also located on the grounds. Case’s house was located at the corner of King and Lottridge which was used as a base hospital during the war. Not only does his grave represent his accomplishments during the war, but also reveals the history of the cemetery. The cemetery did not begin until the 1850s, so many of the 1812 related people, such as William Case (who was originally buried in a family cemetery) were moved here at later dates. The cemetery also contains the graves of people significant to the commemoration of the War of 1812. Sara Calder, a young widower is buried with her family in the cemetery. Sara headed the effort to purchase the Gage Homestead and turn it into Battlefield House, a museum to commemorate the War of 1812. Thomas B. McQueston, of QEW fame, was instrumental in restoring the 1812 forts in Niagara (Fort George and Fort Henry). The final layer of history in the cemetery is that it is actually the site of a War of 1812 fort; Burlington Heights. It is where the Battle of Stoney Creek was supposed to take place, but the British took the Americans by surprise before they could make it to the fort. Participants walking along side the wall of the Fort, Photograph by Author. force opposition forces through a maze to allow for designed kill spots. The terrain was designed for maximum kill, which is kind of ironic since its now a cemetery. Plaques do indicate there was a fort on the site, but they are cleverly designed to fit into the cemetery landscape and would be easy to miss if you did not have a guide to point them out. Robin’s tour was an excellent example of an effective walking tour because it showcased people associated with a theme (in this case 1812), but it also went beyond the gravestones using pictures to illustrate his stories. The stories themselves told the complex, multigenerational and layered history of Hamilton’s connections to the War of 1812. Kayla Jonas writes about heritage at www.adventuresinheritage.com. She works as a Heritage Planner at the Heritage Resources Centre, University of Waterloo and sits on the board of the Architectural Conservancy of Ontario.